Through the combined efforts of the Junior League and the Easter Seal Society, a permanent center for the treatment of Cerebral Palsy opened its doors in El Paso in 1951. The El Paso Guidance center opened in 1954 to treat behavioral problems of emotionally disturbed children. The League realized the impact that an unhappy child can make within the family, school and community. As a result, the League made it a priority to create an environment where emotional disturbances could be treated. 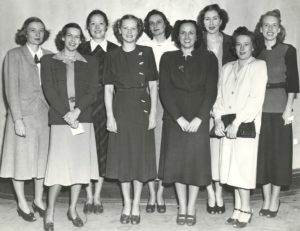 During the 1950’s the League joined with El Paso’s public schools and Texas Western College in the innovative use of the radio and television mediums as supplemental tools to teaching curriculum. A growing teacher shortage combined with increased school enrollment prompted the League to again team-up with the public schools to promote a teacher recruitment program in the El Paso high schools to create an interest in teaching. The League also presented scholarships for teaching majors to Texas Western College. Money was raised in many different ways, including annual rummage sales held in the A.B. 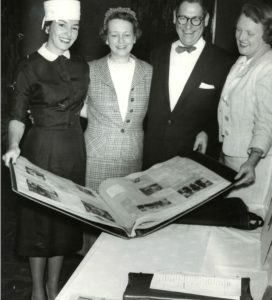 Poe Motor Company building, raising thousands of dollars even in the hardest times; the Charity Ball, a popular fundraiser which was the social event of the season for many years; and the “Junior League Follies Revue” which generated the largest profits. In 1953, the first Board manual was compiled. In 1952-1953, dues were $25.00.